End drug prohibition now. From Mark Perry’s blog Carpe Diem. 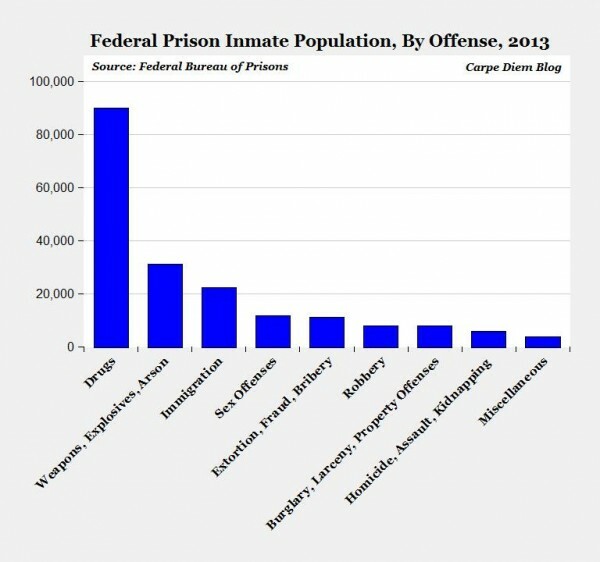 The chart above shows the breakdown of the current federal inmate population by type of offense, according to the most recent data from the Federal Bureau of Prisons. There are currently 90,043 Americans serving time in federal prisons for drug crimes, which is by far the No. 1 offense that results in a federal jail sentence (see chart). Drug offenders make up almost half (47.1%) of our federal inmate population of 218,171, and that helps explain why the US retains its status as the World’s No.1 Jailer with a prison population of 713 per 100,000 population, more than even any of the world’s most notorious and oppressive regimes like Myanmar (120 per 100,000 population), Cuba (510 per 100,000 population), and Iran (333 per 100,000). The only country that might challenge the US as the world’s No. 1 jailer is North Korea. Although information is limited, North Korea’s incarceration rate is estimated to be between 600-800 per 100,000 population.